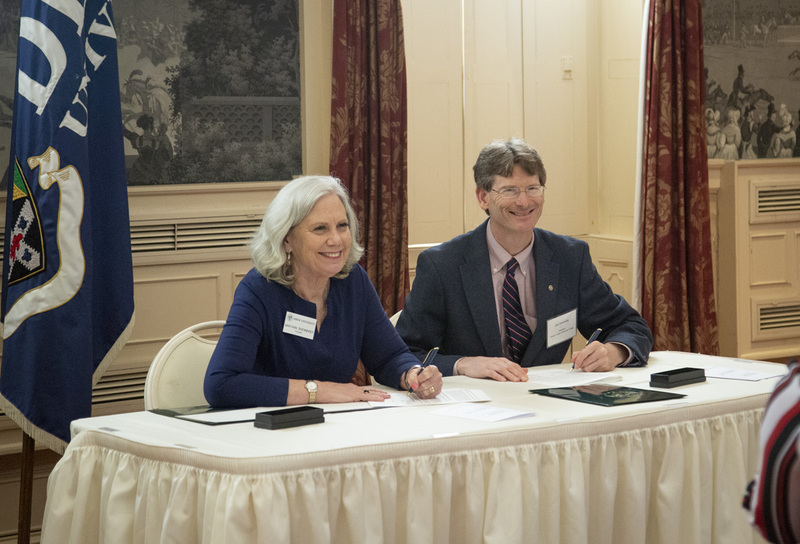 Partnership with Sussex County Community College expands access to Drew’s honors program. Drew President Mary Baenninger and SCCC President Jon Connolly sign deal. March 2019 – Under a new partnership, honors students at Sussex County Community College can pursue a BA or BS at Drew University after earning an associate’s at Sussex, if they achieve a cumulative grade point average of 3.50 or higher. The students will earn merit-based scholarships of $15,000 or $20,000 based on their GPAs and an additional $1,500 scholarship if they’re members of Phi Theta Kappa. The honors transfer partnership is the sixth that Drew has forged with area community colleges. The others are with Bergen Community College, Brookdale Community College, County College of Morris, Middlesex County College and Raritan Valley Community College. “These honors partnerships allow students who are transfer students to experience their four-year degree as a whole and experience continuity that is rich and planned,” Drew President MaryAnn Baenninger said. Indeed, advanced planning is the cornerstone of each deal. With Sussex, interested students will meet with Drew Admissions counselors at Sussex during their first semester in the honors program to review curricular choices. Later, they’ll visit Drew for a tour and information session, meeting professors and peers. And before transferring, they can take up to two Drew courses for free. The goal is a seamless transition from Sussex to Drew. The presidents unveiled the agreement during a ceremony at Drew.